Supporting open research is a 2-day workshop I attended regarding research data management and open data publishing. This post contains notes and hyperlinks to relevant resources. Why should you select data for retention and publications? What are appropriate licences for data? What are some difficulties of fostering openness in your research context? Issues with publication. E.g. data is too large, data is not in digital form, dataset is dynamic. A more detailed discussion by Carly Strasser in 2013: “Some answers to the most common misconceptions about sharing research data”. A more recent article by Katherine Wood in 2017: “Starter tips on sharing data and analysis scripts“. The steering committee should be made up of members representing all colleges, library and university administrators responsible for research and innovation. The committee provides oversight, ensuring that the services meet the needs of researchers. Having senior academics from each college helps to increase awareness and encourage adoption. The project group is a completely open, democratic approach to engaging researchers with RDM. The openness ensures representation from various stakeholders across the university (PI, post-doctorates, students, librarians, IT people, ethics, and more). Informal networks of early adopters or RDM champions provide a space for researchers to connect with peers and share lessons. Having a broader network or community, the boundaries between services and users are blurred. It also fosters a more collaborative, shared-ownership approach to the challenges RDM poses. Providing funding to academic-driven projects to encourage the development of frameworks or prototypes enabling open research. This kind of researcher-led development can achieve better levels of adoption as services are tailored to specific community needs and are embraced and promoted by the researchers. The model allows discussions surrounding the current level and desired level of institutional capability in each area of RDM in the Research Data Service model. 3 levels are defined and each area of RDM has its own definitions. Level 1 – Institutional policy articulates roles and responsibilities for researchers, other staff and students to comply with legal & regulatory obligations and external funders’ RDM policy expectations. 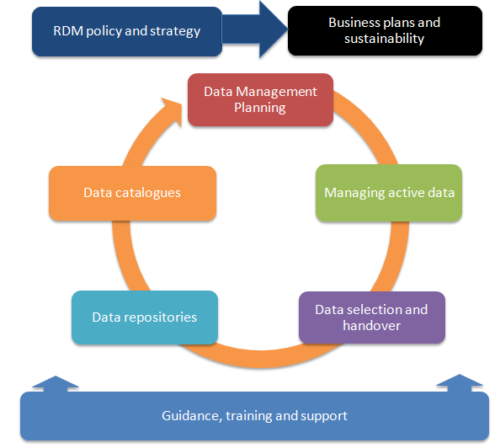 Level 2 – Institutional policy articulates the value of good RDM practice to the institution and its rationale for retaining data of long-term value. Policy is subject to a regular, scheduled review process. Level 3 – Institutional policies with a bearing on RDM (e.g. FOI, ethics, research conduct, etc) are joined up and complementary. Policies are externally promoted, aiming to push the sector forward. Data selection and appraisal identify both the value of research outputs and the most appropriate method of publication. Reflect on the type of metadata that would be required for an institutional data repository? What would be mandated and what might be encouraged? Increasing use of data management plans for researchers to document how they are collecting, using, storing and sharing their data. The Biotechnology and Biological Sciences Research Council has a checklist/rubric to help evaluate DMPs for compliance with their data retention and sharing requirements.